Report PDF file (324 kB) PDF Version. This report is preliminary and has not been edited or reviewed for conformity with U.S. Geological Survey (USGS) editorial standards. Any use of trade, product, or firm names is for descriptive purposes only and does not imply endorsement by the U.S. Government. This intermittent sliding motion mimics the intermittent fault slippage that characterizes the earthquake fault zones. In tectonically active regions, the Earth's outer brittle shell, which is about 50 km thick, is slowly deformed elastically along active faults. As the deformation increases, stress also increases, until fault slippage releases the stored elastic energy. This process is called elastic rebound. Detailed instructions are given for assembly and construction of this demonstration. Included are suggested sources for the vibration sensor (geophone) and the computer interface. Exclusive of the personal computer, the total cost is between $125 and $150. Read through this and the Setup and Operation sections before purchasing any equipment, as some trouble-shooting alternatives are offered. Rough sand paper to cover base of rock or brick: may be required to get best sliding properties. Three C-clamps: One to clamp the winch to one table and two to clamp the rock-slide to another table. Screws: 10 with a length of 1 1/4"
1 13" length of 3/4" PVC pipe, cut into 3 pieces with lengths of 7", 3", and 3"
Geophone: A small 8 to 14 Hz vertical exploration geophone may be purchased from some surplus stores. For example: All Electronics Corporation, (800) 826-5432, http://www.allcomp.com/, currently (November 1998) sells their catalog number GP-1 geophone for $8. Also Arlen Juels of Seistex '86 Inc. has a number of used exploration geophones that he is willing to provide to teachers for the cost of shipping. He can be contacted at AJuels@seistex.com. Analog to digital converter (AD) and display software: The least expensive AD unit that I have been able to find is Dataq's DI-150-SP, which sells for $100. This unit attaches to a PC serial port and includes software for MS Windows that will display the seismic data in real time. Dataq Instruments (888) 666-2907; http://www.dataq.com. Using 1 1/4" screws, attach the sides and stop to the rock-slide base, as indicated in the diagram below. Drill a 1" diameter hole in each of the 1"x6" boards. The center of the holes should be 1 3/4" from the 6" edge of the wood, as indicated in the sketch below. Using the four 2 1/2" wood screws, attach the sides of the winch to the 2"x4" base. The extra length on the base is to allow more room for clamping the winch to a table. Using PVC cement, attach the three pieces of PVC together using the two 90-degree junctions, as indicated. Then slide the 7"-long pipe through the two holes in the winch. If the pipe does not slide easily in the holes, use a round file to enlarge the holes. Glue a straight PVC junction to the end of the 7"-long pipe to keep it from sliding out of the winch. Drill a 1/4" diameter hole through one side of the 7" section of PVC pipe. Feed one end of the non-elastic cord through this hole and tie a knot in the end so that the cord will be securely attached to the pipe. Using the C-clamps, secure the winch to one table and the rock-slide to an adjacent table. The use of two tables prevents the winch from vibrating the table on which the geophone is located. Securely attach a loop of non-elastic cord to the rock or brick, leaving an open loop on one dangling end of the cord. Wind the rest of the non-elastic cord onto the winch. Secure one end of the 15" piece of elastic shock cord to the winch cord and the other to the dangling end of the cord attached to the brick or rock. Set up the geophone and display computer on the table with the rock-slide. The geophone does not have to be on or right next to the rock-slide. In fact, it is better to have it a few feet away so that it is clear that the vibrations from the sliding rock must travel some distance along the tabletop to reach the sensor. Adjust the display software so that the trace is scrolling on the screen and a slight tap on the table is clearly registered. The distance between the winch and the rock-slide should be adjusted so that the shock cord does not begin to wind onto to winch; this maintains a constant elastic component during the entire travel of the rock or brick. Next try pulling the rock or brick along with the winch. The speed should be such that it takes 30 seconds to a minute to move the entire length of the rock-slide. If it slides steadily rather than in discrete events (earthquakes), an adjustment is necessary. Try increasing the friction or using a longer or stretchier section of shock cord. Friction can be increased by gluing coarse sandpaper to the sliding surface of the rock or brick, by using a heavier rock, or by using two bricks, one on top of the other. If the rock slips too far in one event, such as more than half of the entire length of the rock-slide, then decrease the weight of the rock, decrease the length of the elastic cord, or use a less stretchy elastic cord. When the adjustments are complete, the rock should generate approximately 4 to 10 events per run, and each of these "earthquakes" should be clearly registered on the computer screen display (the seismogram). Most of the Earth's processes are slow, but steady. This makes them difficult to comprehend, because little seems to happen on a human time scale. Mountains are slowly uplifted and even more slowly eroded away; rivers slowly cut gorges and transport sediments to growing deltas, but the pace is so slow that even after many generations little seems to have changed. Earthquakes are an exception; they involve rapid enough slippage on a fault to cause waves of vibrations to be radiated outward. The vibrations can be felt and, if the fault intersects the surface of the earth, the resulting displacement can be observed directly. Plate tectonics is the study of the consequences of the slow motion between the plates that make up the outer shell of the earth. There are about a dozen major plates and they are about 50 km thick. The temperature and material properties at the base of the plates are such that they can slip steadily without producing any earthquakes. However, when a plate itself is deformed, due to mountain building, for example, or when one plate must slide past another, earthquakes are produced. For years, and in some cases as much as many hundreds of years, very little slip may occur across a portion of one of the boundaries between two plates that are in relative motion with respect to each other. During this time both plates are deformed and bent elastically near the boundary, and all the while the stress in the region is increasing. Eventually, during an earthquake, the plates quickly slide past one another and the stress is greatly reduced. This process of slow deformation followed by rapid release is called elastic rebound and was first proposed by H. F. Reed following studies of the 1906 San Francisco earthquake. The following figure by USGS seismologist Will Prescott schematically illustrates a fence crossing the San Andreas fault in California. An excellent tutorial on earthquakes, which was developed by the Southern California Earthquake Center, is available at http://www.scecdc.scec.org/Module/ . Although aimed at high school and undergraduate levels, this module would also be a good source of information for middle school students who wanted to learn more about this subject. Especially helpful are the animations of the various types of faulting. The vibrations from large earthquakes can be strong enough and last long enough to be a serious hazard. They can cause man-made structures such as buildings and bridges to collapse and they can cause ground failures such as landslides. If an earthquake produces rapid deformation of a body of water, be it uplift of the floor of the ocean or movement of a lake or fjord, a large and potentially deadly wave of water can be generated. When in the ocean, a wave of this sort is called a tsunami wave, whereas in a smaller body of water it is called a seiche. A small dish of water places on the table with the rock-slide will show small ripples following an "earthquake," analogous to the waves that could be generated in a lake. Waves in the solid Earth. Some of the seismic waves generated by earthquakes are confined to the outermost layers of the earth (surface waves), somewhat like the ripples that travel outward on the surface of a pond from the point where a rock has hit the water. Other waves (body waves) travel outward in all directions, including straight down through the center of the earth. Much of what is known about the inside of the earth was learned from the study of the waves generated by earthquakes. The three most common states of any material are solid, liquid, and gas. A material in any of these three states will resist having its volume changed by being squeezed or stretched. A compressional wave, such as a sound wave in air, consists of a series of compressions and stretches (called dilations) of the air as the sound travels outward from the source. Compressional waves can also travel in a liquid or a solid. In a compressional wave, the back and forth motion of the material is in the same direction as the wave is traveling. The figure below shows a compressional wave traveling to the right. The material is alternatively compressed and expanded from its resting state as the wave passes through. Of the three states, solids are the only one that will, upon being bent, return to their original shape. Another way to say this is that solids resist shearing. The diagram below illustrates the difference between shear and compression. Unlike liquids or gasses, solids can transmit waves that involve back and forth motion of the material perpendicular to the direction that the wave is traveling. The figure below shows a shear wave traveling to the right. Note that the material is moving in and out of the page, perpendicular to the direction of wave travel. A slinky may to used to demonstrate both compressional and shear waves, which can be seen traveling along the length of the slinky. Compressional waves are generated if one end of a stretched slinky is pushed quickly along the axis of the slinky and shear waves are generated if one end is displaced quickly in a direction perpendicular to the axis of the slinky. It is interesting to consider the flow of energy that is involved in making the rock-slide. Chemical energy from one's muscles is first used to turn the winch handle. At first the rock does not move, so the energy is stored in the elastic cord. The more the elastic cord is stretched, the more energy is stored within it, and the greater the force on the rock. When the static friction that is holding the rock in place is exceeded, the rock will start sliding. Because sliding friction is less than static friction, the rock will continue sliding some distance until the force from the elastic cord is equal to the sliding friction that is resisting motion of the rock. The energy that was slowly stored up within the elastic cord is quickly released and converted into kinetic energy of the moving rock. As the rock slides along, its kinetic energy is dissipated by heating up the sliding surfaces and by radiating energy in the form of elastic waves. The seismograph detects these elastic waves as they pass by, and they are displayed on the seismogram. The geophone works by magnetic induction, which is the term for the generation of a voltage within a conductor that is subjected to a varying magnetic field. A geophone consists of a coil of wire suspended by a spring. A strong magnet is attached to the geophone's case, so when the coil vibrates up and down on its spring it is moving with respect to the magnetic field of the magnet. This motion of the coil with respect to the magnetic field generates a voltage, and it is this voltage that is displayed on the seismogram. A very simple geophone can easily be made by winding magnet wire on a small plastic cylinder, which is then mounted vertically. An old marking pen can be cut up to make the plastic tube. One end of a 4-inch-long piece of rubber from a rubber band is attached to a magnet that is just small enough to slide freely within the plastic cylinder. The other end of the rubber band is attached to a mounting point directly above the cylinder. Any vibration will cause the magnet to bounce up and down within the coil and will produce a small voltage in coil wire. To see how the homemade geophone is working, it can be attached to the AD and computer display in place of the commercial geophone. Although not as sensitive, this illustrates the principal of how a geophone works. It is best to use a strong magnet, such as a rare-earth magnet, so that even a slight motion of the magnet will generate a detectable voltage. Sources of strong magnets include Radio Shack and All Electronics Corporation, (800) 826-5432, http://www.allcomp.com/. The seismogram that is displayed on the PC's screen is a graph of the voltage produced by the geophone as a function of time. The voltage is proportional to the velocity of the coil with respect to the magnet, and for frequencies higher than the natural frequency of the geophone this voltage will be proportional to the vertical velocity of the table at the location of the geophone. Another time graph that the students may be more familiar with is the stock market average selling price versus time. In seismology, the energy of the vibrations produced by an earthquake can vary enormously. The total energy of the seismic waves generated by the smallest earthquake that could be located by a local network of seismometers is about 2,000 joules (J). The largest earthquake ever recorded released 11,200,000,000,000,000,000 J of energy as seismic waves and was observed on seismometers all around the World. As you can imagine, it is not very convenient dealing with numbers that have such a large range. On the Richter magnitude scale, the magnitude of a 2,000 J event is minus 1.0 while the magnitude of the largest recorded earthquake was 9.5. The relationship between earthquake energy and magnitude is said to be logarithmic because the equation relating energy and magnitude includes a logarithmic term. For energy, E, in joules, the equation is: log E = 1.5 M + 4.8 (this is log to the base 10). Note that this indicates that an increase of one unit of magnitude results in 32 times greater energy release. 2.0 1 ton 63.1E+06 J Only felt nearby. 4.0 1 kton 63.1E+9 J Often felt up to 10's of miles away. *This is the approximate amount of TNT that would be required to generate high-frequency seismic waves of similar amplitude to those from an earthquake of each magnitude. This is based on the observation that a 1-kton explosion is approximately equivalent to a magnitude 4 earthquake (Evernden and others, 1986). 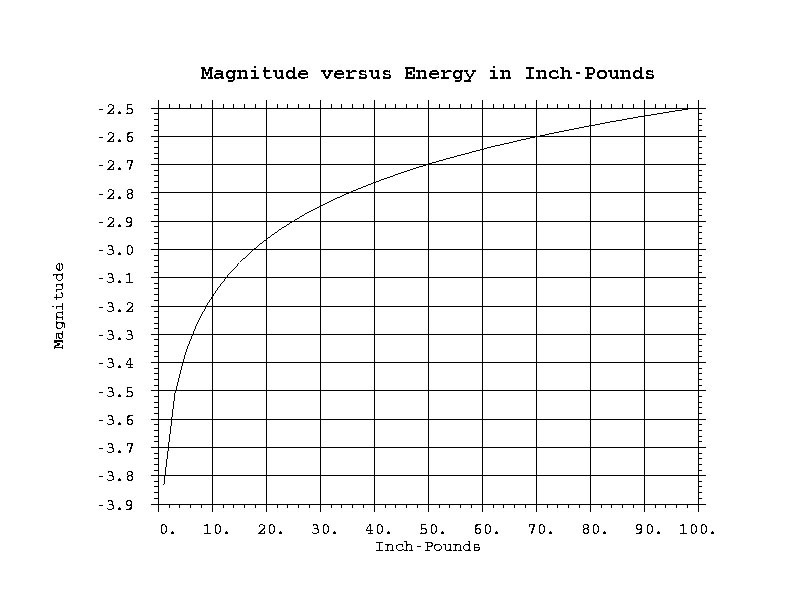 Table of magnitude versus energy for the range 1 to 100 inch pounds. Predicting when the rock will slide is similar to the problem of predicting when an earthquake will occur. A very long-term prediction would be, assuming that the winch is turned steadily, that earthquakes will eventually take the rock from one end of the board to the other. A similar prediction, often called a forecast if it is not related to a specific earthquake at a specific time, would be that earthquakes will continue to occur on the San Andreas fault as long the Pacific Plate continues to move northwestward with respect to the North American plate. In California, the San Andreas fault is the boundary between these plates. One can also say in a qualitative way that the longer it has been since an earthquake has occurred on an active fault, the higher the probability that it will occur within the next interval of time. This is clear in the table-top earthquake demonstration because one can see the elastic cord stretch and thus increase the force on the rock. In a similar way today, global positioning satellite (GPS) measurements are being made of the deformation of the ground surface in areas such as California. If these measurements are continued for decades they will allow scientists to gauge which areas have been strained the most, and are therefore the most likely to experience earthquakes. For each earthquake place a colored stick-on dot on the map at the location indicated. Use red for earthquakes less than 50 km deep, orange for earthquakes between 51 and 150 km deep and yellow for even deeper events. After a period of some months, the global pattern of earthquakes will be clearly indicated on the map. Keep a list of all of the countries effected, and for an added challenge try to find the word for earthquake in the language of each country. I am grateful for very helpful reviews of this report by Ed Cranswick and Susan Rhea. In addition, I thank Ross Stein for demonstrating the basic idea of using an elastic cord and a rock as an analog for earthquake faulting.